We keep homes and businesses protected. For roofing jobs large or small, we employ a time-tested and proven approach, backed up by our reliable service and top-quality materials. 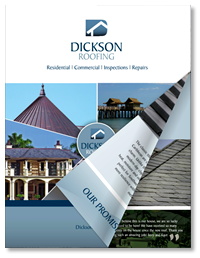 Dickson delivers a diverse array of roof installation, inspection, and repair services. Every roof is actually a system with multiple components. An important element is the underlayment, the water-resistant or waterproof barrier that is installed directly onto your roof deck. It is applied under all other roofing materials as an added layer of protection from severe weather. We only use the best materials and treat each project as if it’s our own home and roof.